On this November's ballot, Sacramento County voters will be asked by the Sacramento Transportation Authority (STA) to approve a 30-year one-half cent sales tax increase. This increase will appear on the ballot as Measure B and has been dubbed as Fix-it-First by proponents. 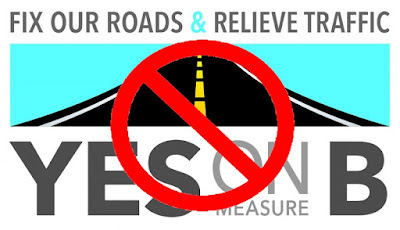 While yes on B supporters, including Sacramento Mayor-elect Darrell Steinberg, who kicked in $200,000 from his campaign war chest, are wrapping the proposal as a remedy to deteriorating roads, there are also unappealing items stashed within the measure. These unattractive aspects should be of concern to any taxpayer who is interested in keeping elected officials fiscally accountable, not unduly burdening low-income families with an additional regressive tax for the next 30 years, or concerned about environmental issues and suburban sprawl. To be sure, there are certain portions of B that are appealing. Fixing old, crumbling roads in unincorporated parts of Sacramento County needs to be addressed, and this funding source will help with that. Also, the use of the funds to support the enhancement of mass transit within the county are worthy of voter support. Beyond those considerations, there are other items that voters, particularly in Elk Grove, need to scrutinize. First, as observers of the Elk Grove City Council know, that body has consciously decided to defer $8 million in annual regular road maintenance for several years. Instead of using those taxpayer dollars for non-glamorous but practical purposes, the Elk Grove City Council led by Mayor Gary Davis have foolishly pursued pie-in-the-sky schemes such as the failed recruitment of a Major League Soccer franchise to the City. By approving this measure, Elk Grove voters will be granting whomever our future Mayor and Council members a de-facto authority to continue their reckless spending habits. This is unacceptable. Furthermore, a major portion of the funding coming to Elk Grove should B pass will be used for the construction of the Capital Southeast Connector Road and Kammerer Road extension. Together those projects will connect I-5 in Elk Grove to U.S. Highway 50 in El Dorado Hills. Much of that proposed traffic light-controlled road will go along Grant Line Road and thus put Elk Grove's rural area in peril. Beyond that consideration, the connector will open much of the agricultural areas along its route through Elk Grove for more housing development and more suburban sprawl. Aside from Steinberg, the assortment of contributors to the Yes on B include construction trade unions and housing developers. While they may tolerate the fix-it-first and mass transit funding, the big prize in their scope is the opening of the Capital Southeast Connector and all the housing development that will follow. As stated earlier, there are things that Measure B appropriately addresses, but much of it is unfriendly to taxpayers and the environment. With a super-majority of 66.6-percent needed for approval, we urge Sacramento County and Elk Grove voters to reject the measure and have STA come back in 2018 with a smaller, more environmentally and taxpayer friendly measure. Every vote will matter.